The most dangerous thing about autonomous cars isn't snow or rain or Neo hacking the mainframe. It's the meat bag behind the wheel. Specifically, it's the "handoff" from car to driver, and that's why Google nixed the steering wheel, brake, and accelerator on its self-driving prototype. The Grey Lady hinted at the problem when introducing Google's third generation autonomous car with the line that, "Google's brightest minds now say they can't make that handoff work anytime soon." Here's the problem: You're riding in your self-driving car, reading emails, checking tweets, admiring the latest Kate Upton spread when – for whatever reason – the car encounters a problem. It needs you to take over. Like, immediately. That's where Google has a problem. It hasn't figured out how to manage the transition from piloted mode to manual mode in a safe, controlled fashion. And it's something that leaders in the autonomous driving movement have been trying to solve, with no solution in sight. Clifford Nass, the late Stanford University professor, has talked about it in the past. 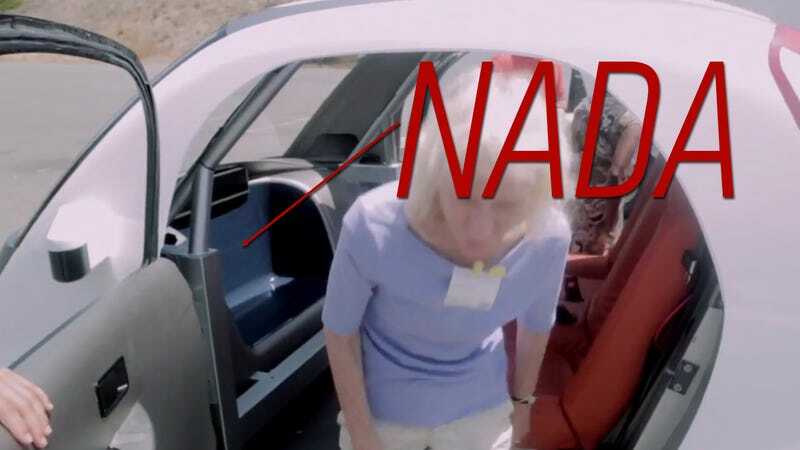 "People worry about the wrong thing when it comes to the safety of autonomous cars," Nass said in an interview last year. "There are going to be times where the driver has to take over. And that turns out to be by far the most dangerous and totally understudied issue." Take a driver that's been zoning out for the past 45 minutes and thrusting them into traffic spells disaster. They're unfocused, they're distracted, – hell, they could be shitfaced – and they're complete unaware of the environment they're forced to navigate. We believe the hand-off of control between self-driving vehicles and their human passengers may present the greatest challenge. If self-driving becomes a reality and those who are incapable of assuming control of the vehicle (whether because they are asleep, drunk, unlicensed or impaired in some way), what exactly will happen? Would passengers and their vehicles be stranded? Obviously, some kind of advanced warning system will be key in the handoff from car to driver, but Google has nixed this ability altogether with its purpose-built autonomous car. Without any controls for the driver, they've taken the "easy" way out. Add in the fact that speeds are limited to 25 MPH – the national speed limit for both residential areas and school zones – and it becomes even more apparent that Google can't trust the driver to take control. A 25 MPH impact has less than half the kinetic energy as a 35 MPH crash, let alone something approaching freeway speeds. Both MIT and research firm IHS have called out this issue before. MIT's latest study points out that "at precisely the time when the automation needs assistance, the operator could not provide it and may actually have made the situation worse." IHS echoes that sentiment in its autonomous driving report, saying, "One identified standard need is how to hand back the control from self-driving mode to human driving mode. Clear procedures or standards for this process will be needed in a few years and preferably sooner." If any of this sounds vaguely familiar to plane buffs, it should. It's a problem the FAA has been studying for nearly a decade. The agency released a report last year that identified an over reliance on auto pilot systems and required pilots to manually fly planes to keep their skills intact. That's what's required of an elite cadre of professionals that carry hundreds of souls onboard – not your average driver that hasn't been tested since they snagged their license at 16 under woefully inadequate testing procedures. Pilots overshooting an airport by 150 miles is one thing. Drivers engrossed in their Facebook feed is another. That's where the real problem lies and why Google made the decision to remove the most basic driver controls. It's a step backwards for the autonomous driving movement. They've hobbled functionality in the pursuit of perfection, and until Google figures that out, we'll still be years away from an autonomous car for the masses. But at least they remembered the cupholders.